While the family hot tub is an arena for the kids to splash and play games, it is likely a sanctuary of peace and quiet for the adults. A backyard hot tub can fulfill the needs of both age groups, but what about combining the two to create meaningful family time? After all, the spa was purchased with hopes of getting the most out of it. 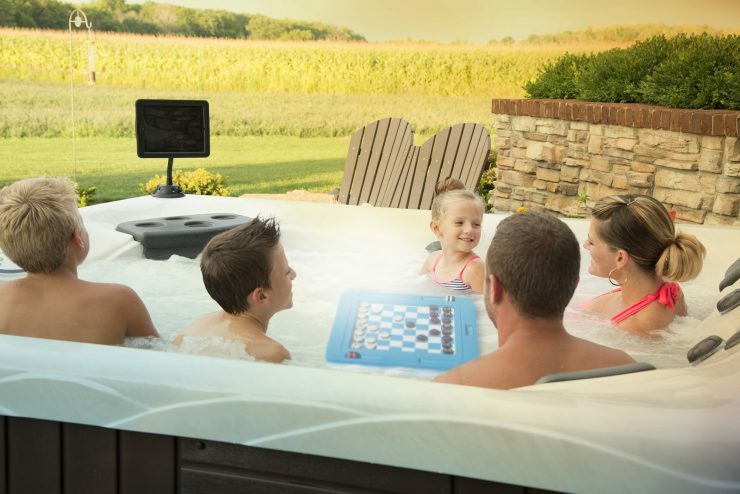 Rather than stepping on toys that sunk to the bottom, or begging Mom and Dad for more “play time,” the hot tub can be a place for the entire family. As a part of Purposeful Parenting Month, let’s take a look at the ways you can transform your serene backyard hot tub into a family fun zone, sneak in a science lesson and help kids cultivate deeper friendships. Water is one of the few places you probably don’t want to bring your phone or other devices. With the risk of it slipping in and being damaged beyond repair, it is reasonable to insist that kids leave electronic devices inside. This rare window without a device in hand allows parents and kids to talk, relax and grow as a family. While hot tub maintenance is probably not on your child’s list of priorities, encouraging their participation in the upkeep can be a fun, valuable way to spend time with the whole family. Your family science lesson could include teaching kids how to check water quality and understand what each reading indicates, as well as how to correct and maintain ideal levels. Teach them to check water prior to, and after, use, and discuss what could have caused the change and how to remedy it. Remember to always supervise chemical usage and keep chemicals out of reach of children. To learn more about including kids in hot tub maintenance and to download our Hot Tub Maintenance Guide, read our blog on maintenance. If you are the neighbors with the hot tub, your house is likely a popular spot. If pulling the kids away from their friends isn’t a battle worth fighting, invite their friends to join. This creates an opportunity to get to know your kids’ friends in a relaxed environment and offers a unique chance to observe how they interact with each other when electronic devices are not around. Not to mention, it gives them a chance to work on their conversation skills and get to know their friends better. For fun ways to get the conversation started, review the kids’ conversation games in our Hot Tub Games Guide. Still trying to find the best hot tub? To discover which Master Spas hot tub would fit your family best, check out our find a hot tub tool.